We are fortunate to have the local Sure Start Children’s Centre within the school grounds. 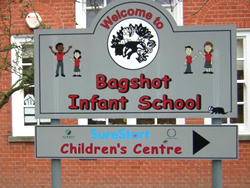 Its services are available to all families with children under the age of five years living in Bagshot, Lightwater and Windlesham. It supports parents with parenting advice, access to specialist child and family health services, helping people into work – as well as providing activities for parents and carers and their young children to come together. Not only are our parents able to access easily the support and information from Sure Start, but we’re able as a school to be able to draw on the skills and knowledge of the Sure Start team to help our parents. To visit the Sure Start website.